For Spartak Moscow that’s the very first stadium in history. One of Russia’s most famous sides had been attempting to build a ground to call their own since 1994, but for over a decade Spartak only tasted failure. As billionaire Leonid Fedun decided to relocate the club to north-western Tushino district, the dream became more realistic. His first plan was abandoned, but served as a base for the second one, which was drawn in detail by 2009. In May 2010 preparatory works began on site, right next to the famous airport in Tushino. By October proper construction works were under way and delivery was announced to be late 2012. This proved impossible as 2011 brought severe delays. Along changes to the time frame, those concerning budget also came. From the initial figure of $340 million the stadium’s cost inflated to $420 million (or RUB 14 billion). However, the funding came entirely from private sources of Lukoil oligarchs Fedun and Vagit Alikperov. Eventually even the deadline of July 2014 was exceeded very slightly, but by August the stadium was ready for opening. 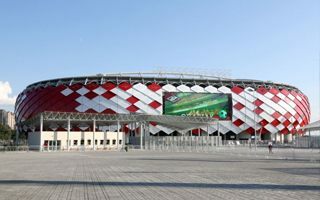 On August 27 president Vladimir Putin officially opened the stadium, while the first game announced was the friendly against Crvena Zvezda Belgrade (Sept 5). Design created by AIKOM Russia and Dexter Moren Associates exploits the club crest to create the stadium’s key aesthetic feature. The stands are wrapped with scales, each shaped like the crest and coloured either red or white, accordingly to club colours. Only the main grandstand is different, completely covered with glass. Also, a large screen was mounted onto the façade in the east. Inside the double-tiered stands accommodate 42,000 people. This means an increase from the original 35,000 planned back in 2006, but may be further expanded if need be by 4,000. This solution is expected to be used for games of the 2018 World Cup. All of the western grandstand was given to corporate clients. The lower side provides over 5,000 premium seats, while the upper has 48 skyboxes. Next to the stadium a complex of 6-8 training pitches is planned. And, a very rare solution worldwide, a secondary stadium will be built for games held during the harsh winter. Completely domed, the stadium will hold 12,000 people and may also be used as an independent event venue.